Countless aging Americans find themselves under constant assault from excess glucose calories. Even health-conscious, active people can experience higher-than-desired blood sugar levels as they age. 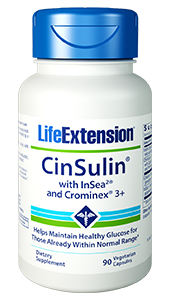 Life Extension now offers an enhanced, all-natural, multipronged approach: CinSulin with InSea2 and Crominex 3+. Studies in humans have proven equally impressive. 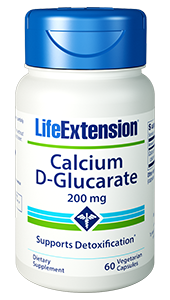 In a recent double-blind, placebo-controlled clinical trial,42 a group of maturing individuals (average age 61) taking 500 mg per day of the cinnamon extract contained in this CinSulin® formula experienced an average decline of 12 mg/dL in fasting blood glucose after only two months. This novel cinnamon extract also produced a significant decrease in after-meal glucose spikes (an average of 32 mg/dL) after ingestion of 75 g of carbohydrates! The danger with cinnamon in other supplements are the presence of naturally occurring, toxic fat-soluble compounds known as aldehydes. 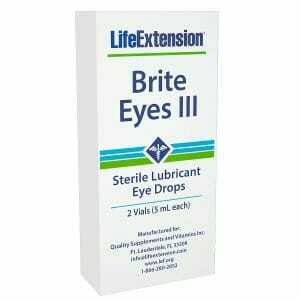 Life Extension has identified a highly purified water-soluble cinnamon extract standardized to the bioactive Type-A Polymers using a patented process that eliminates these dangerous toxins. 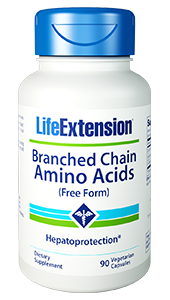 Combined with CinSulin® and InSea2®, the result is an unrivalled formula that affords optimal support for healthy glucose metabolism in aging individuals. InSea2® is a trademark of innoVactive. 37. Diabetes Care. 2003 Dec;26(12):3215-8. 38. Diabetes Obes Metab. 2007 Nov;9(6):895-901. 40. Phytomedicine. 2011 Feb 15;18(4):298-302. 42. FASEB J. 2010; 24:722.1. 43. J Metab. Submitted for publication. 44. Diabetes Res Clin Pract. 1995 Jun;28(3):179-84. 45. Proc Nutr Soc. 2008 Feb;67(1):48-53. 47. J Trace Elem Med Biol. 2011 Jul;25(3):149-53. 48. Ned Tijdschr Geneeskd. 2004 Jan 31;148(5):217-20. 49. Altern Med Rev. 2002 Jun;7(3):218-35. 50. Saudi Med J. 2000 Jan;21(1):45-50. 51. Br J Nutr. 2007 Jun;97(6):1187-95. 52. Yakugaku Zasshi. 2005 Jul;125(7):587-91. 53. J Ethnopharmacol. 2002 Jan;79(1):81-7. 54. J Nutr Sci Vitaminol (Tokyo). 2005 Dec;51(6):413-8. 55. Yakugaku Zasshi. 2007 Feb;127(2):385-8. 56. Indian J Exp Biol. 2001 Aug;39(8):760-6. 57. Indian J Exp Biol. 1997 Mar;35(3):297-9. 58. Phytother Res. 2007 May;21(5):401-5.